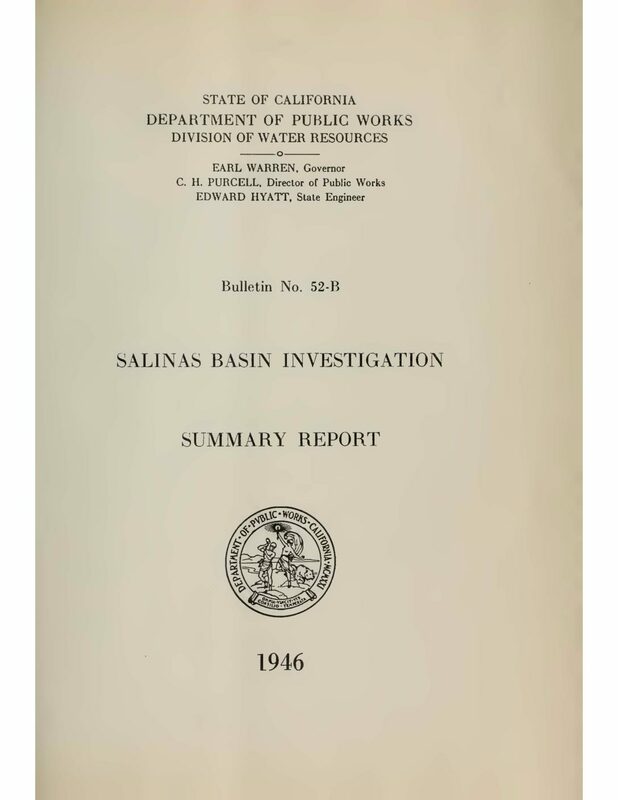 The Board of Supervisors and the Flood Control and Water Conservation Conmittee of the County of Monterey became concerned in April 1944 over the intrusion of saline water in the ground water supply utilized for irrigation, domestic and industrial purposes in the lower reaches of the Salinas Basin near Monterey Bay. The entire agricultural and urban development in the basin depends on an adequate supply of ground water of good quality. There had been some abandonment of wells in the Salinas Basin near the bay shore due to excessive salinity as early as 1938. Accelerated encroachment of the contamination occurred in 1943, and the matter was brought to public attention in 1944. The County of Monterey and the Department of Public Works, State of California, executed a contract on July 10, 1944, providing for maintenance in cooperation an investigation of the water resources of the Salinas Valley in Monterey County and conditions relative thereto which obtain in the valley or affect the water supplies available therefor. It further provides that the Department shall prepare a report based on the investigation setting forth the physical facts pertinent to water supply and to salt water Intrusion, and if possible, incorporate findings as to a method or methods of solving the problems involved. In enacting the Sustainable Groundwater Management Act (SGMA) the California Legislature, for the first time ever, expressly linked the two historically distinct legal regimes governing water in the state that previously had been entirely separate: one governing surface water use and the other groundwater use. SGMA requires Groundwater Sustainability Agencies (GSAs) and their Groundwater Sustainability Plans (GSPs or Plans) to consider and address the groundwater-surface water interaction, and specifically the impacts of groundwater pumping on surface water beneficial uses. SGMA defines sustainable groundwater management as the avoidance of six “undesirable results” identified in the law. The purpose of this guide is to help GSAs and other stakeholders understand and comply with the requirement of SGMA that groundwater withdrawals must not cause “significant and unreasonable adverse impacts on beneficial uses of the surface water,” known as “undesirable result no. 6.” This guide is based on the principle that existing legal frameworks (laws, regulations, court decisions, etc.) provide the clearest and most pertinent guidance on what constitutes undesirable result no. 6. This guide addresses only the explicit legal aspects of this statutory mandate. It does not address technical and scientific aspects of SGMA compliance and offers no advice on the steps GSAs must take to get an adequate technical understanding of the groundwater-surface water connections under their purview. GSAs may look to other sources for guidance on that front. 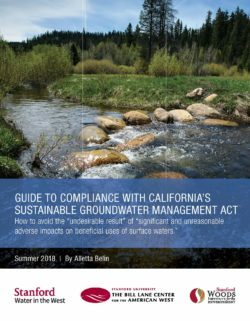 In addition, “Navigating Groundwater-Surface Water Interactions under the Sustainable Groundwater Management Act,” authored by experts at the University of California Berkeley provides a helpful overview of the steps involved in implementing SGMA provisions relating to groundwater-surface water interactions.